As the demand for electric vehicles increases, more and more automotive manufacturers are beginning to produce and sell electric cars. Download our catalogue to keep up with the latest manufacturing technology available to assist production. If you find it time-consuming and difficult to set up a vision program for each inspection item, deal with variations in good parts or inspect complex features, browse through our guide about image processing tips from our experienced engineers. Work that was conventionally performed with separate devices, such as marking, code reading and character inspection is now possible with a single unit. Have a look the material below to find out about the advantages of laser markers with built-in cameras. 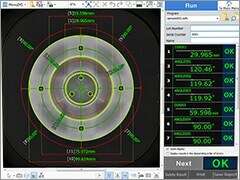 Simply place the target on the stage and press a button to measure up to 99 dimensions in seconds. The IM Instant Measurement System speeds up dimensional measurements without the need for specialist training for users. The SZ-V Series Safety Laser Scanner is equipped with a detachable monitor unit allowing users to operate the device from a remote, more convenient location, whilst the built-in camera allows for viewing the detection area via real-time video. Do you have problems at your worksite due to static electricity? Check out the guide below to learn about efficient ways of eliminating static electricity with our bar, blower or spot type devices.